These meal prep quinoa bowls are the perfect meal for spring. With greens, fluffy quinoa and roasted spring vegetables, they're so delicious and healthy! Now that it's finally feeling like Spring, I'm ready to start hitting the farmer's market and snatching up my favorite spring veggies. For me, the best part of getting into Spring, aside from the warmer weather, is the produce. I shared my Spring Produce guide earlier in the week, and today's post uses a few of my favorites from that list. And we're turning them into meal prep quinoa bowls. I gotta say, these types of meals are probably my favorite to make and eat. They're so easy, super nourishing and customizable based on what produce you can find seasonally! To me, spring = brightness. And brightness in flavor = lemon. So this time of year my absolute favorite spice to roast veggies with is lemon pepper seasoning. 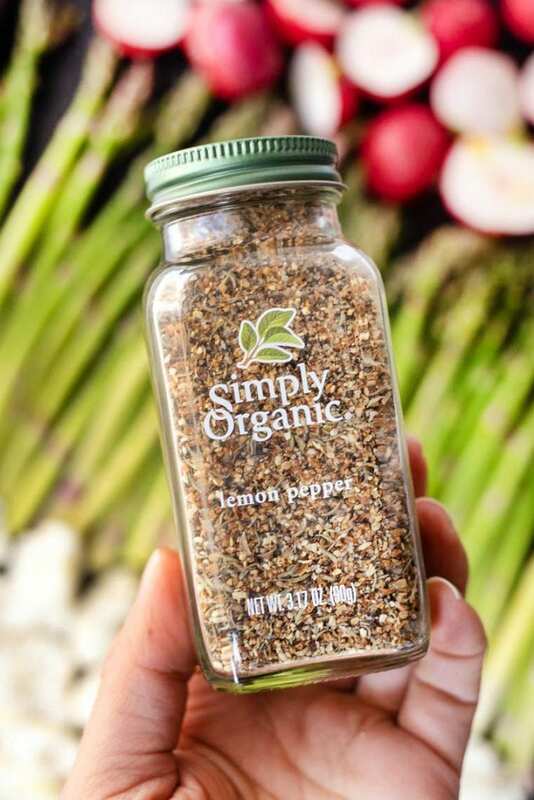 I'm thrilled to be partnering up with Simply Organic again for today's post because they have the best lemon pepper seasoning on the market. I've talked about my love of Simply Organic spices before – and even shared a list of my 10 must-have spices – and I've recently started using some of their blends which actually just makes everything so much easier. They've perfectly balanced the ratio and with just one bottle, you can add a whole ton of flavor. 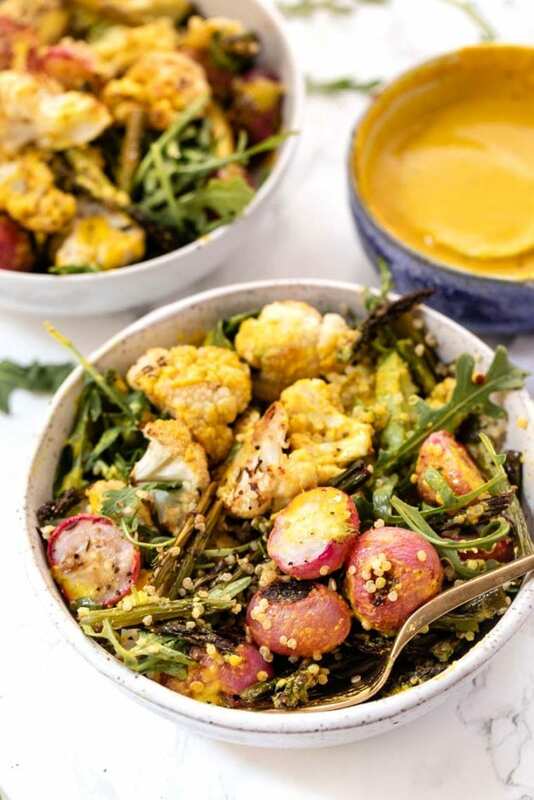 I love lemon pepper with roasted veggies because it has the classic combo I usually use – salt, pepper, garlic, and onion – but also lemon peel, and thyme. It's just perfection! Especially with spring vegetables because it's zesty, bright and flavorful without being overpowering! I just love roasting spring vegetables. 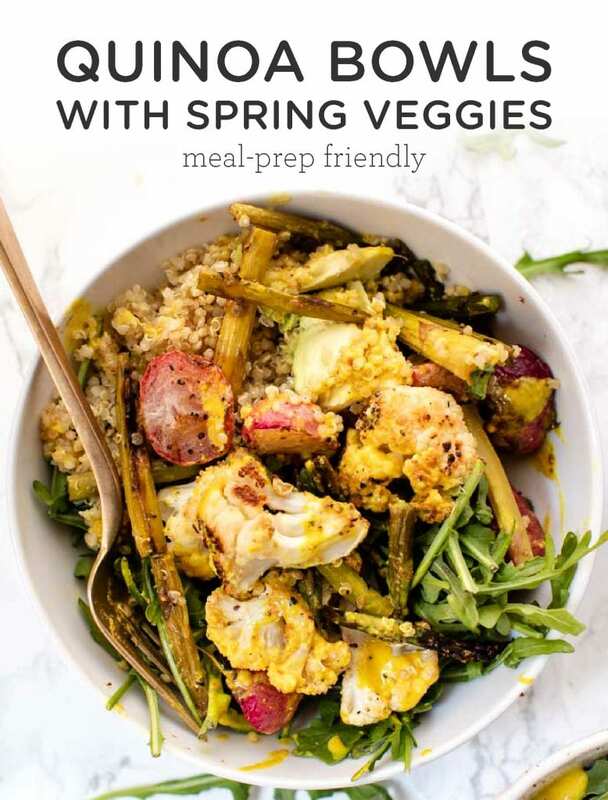 I believe in the balance of cooked and raw foods in the diet, and since Spring weather can be warm but not super hot, roasting some of these veggies is actually awesome and makes them feel so much more nourishing. The combo is not only colorful but also a great balance of taste and texture. 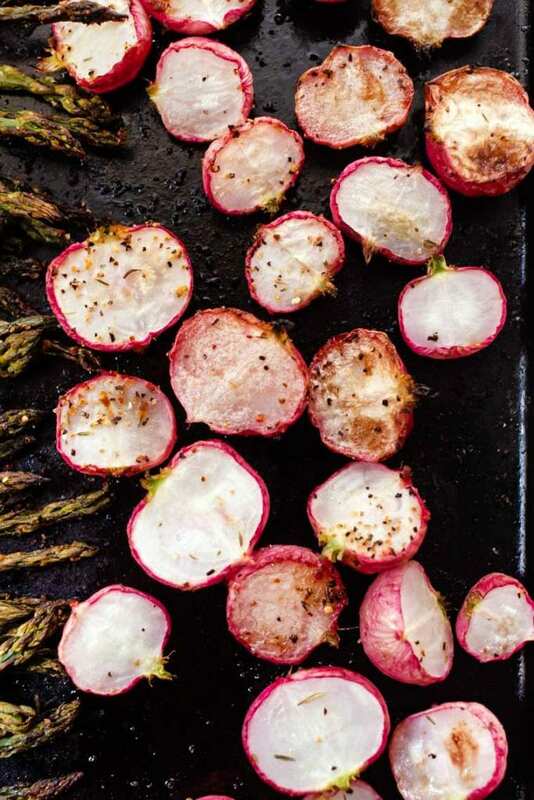 Cauliflower is kind of meat, asparagus is a little tangy and the radishes are earthy, but with a light sweetness. They're actually my favorite thing in this bowl! As we move our way into the warmer months, this is absolutely going to become my go-to meal prep recipe. I love that you can use whatever veggies you find at your local farmer's market, but also the dressing. It's everything! To keep things nice and bright, I wanted to create a dressing that would go with any type of veggie, but that was also super bright. And of course, since it's me, it had to be creamy! 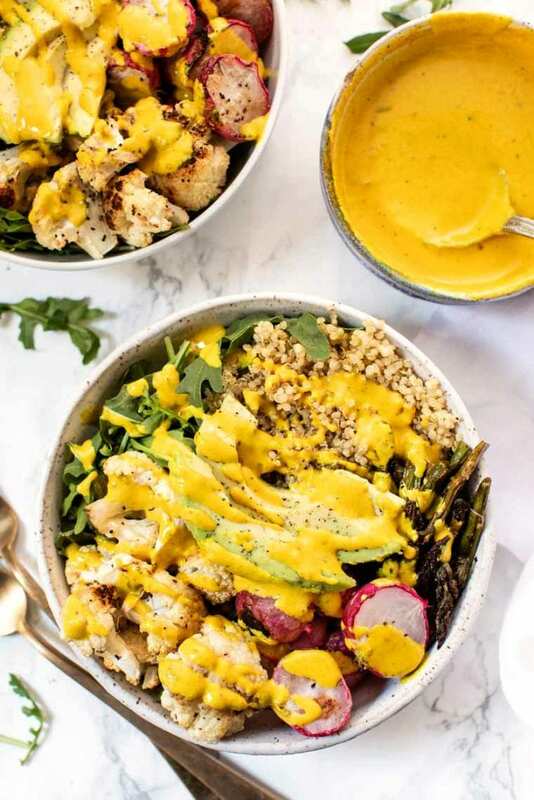 So I settled on this Creamy Lemon Turmeric dressing made with a few of my favorite Simply Organic spices. We're using turmeric, garlic powder, and crushed red pepper flakes for some heat, along with tahini, lemon juice, salt, and pepper. It's simple, it's vibrant, and it's just perfect with the combo of roasted veggies, quinoa, and greens. I've talked a lot about my love of quinoa bowls, but these are feeling extra special. Not only are they full of some of my favorite veggies, but they're also one of those meals that can be made ahead. In order for something to be meal prep friendly in my opinion, it needs to last a least 4 – 5 days in the fridge. This one does because a) it doesn't have anything that gets soggy and b) doesn't use animal protein. 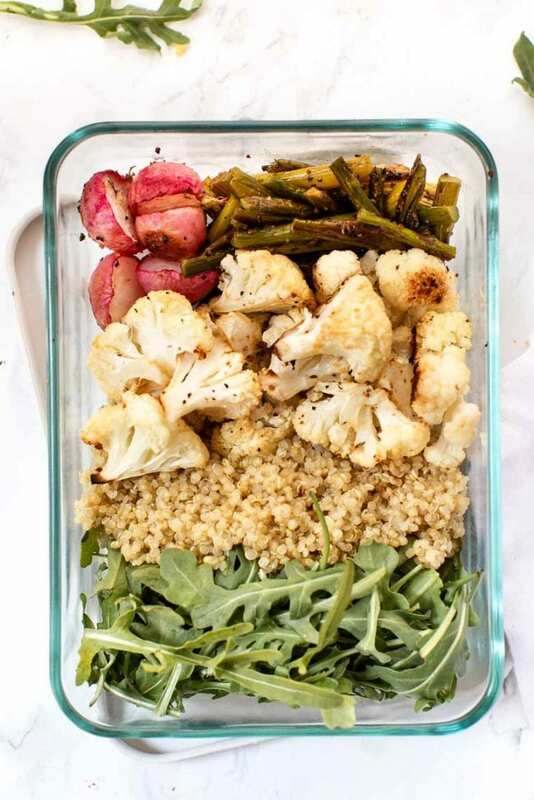 You can just roast your veggies, cook your quinoa, assemble them like you see above and you're good to go! These are the containers I love to use for meal prepping meals like this because they're flat and stackable and take up very little room in your fridge! Finally…the sauce! In order to keep these as fresh as possible, leave the sauce off until the day of. Better yet, pick up some of these little dressing containers and just bring the sauce with you. It'll ensure your bowls – and specifically your greens – are crispy and delicious all week long! These amazing meal prep quinoa bowls are the perfect meal for spring. 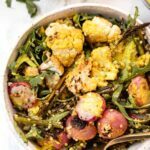 With a combination of greens, fluffy quinoa and roasted spring vegetables, they're delicious and healthy! Preheat the oven to 400 degrees F. Spray a baking sheet with non-stick cooking spray and set aside. Trim the ends off the asparagus. Add to the baking sheet, along with the cauliflower and radishes. Drizzle with olive oil, sprinkle with lemon pepper seasoning and stir to coat. Roast in the oven for 20 - 25 minutes, until lightly browned and softened. Flip halfway through to ensure even cooking. While the veggies are cooking, whisk together the dressing ingredients. Add water, one tablespoon at a time, as needed to thin the sauce. Once you get a drizzlable texture, you're good. When veggies are done roasting, assemble the bowls. Divide all the ingredients evenly between four bowls. Top with the sauce and some sliced avocado.